Enjoy cool, cute, best Bachpan status in Hindi for Whatsapp, Facebook. Get popular, new, unique Bachpan status for Whatsapp in Hindi, English. 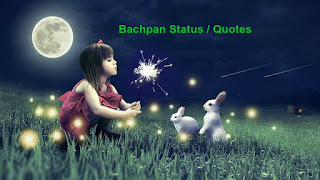 Only latest Bachpan status quotes in Hindi, English. If you are missing your childhood status or seeing your bachpan in your child then live your childhood by sharing the best of Bachpan status for Whatsapp. This section will give you best, short and cute Hindi Bachpan quotes which are written in English font. Can read: Best childhood status for Whatsapp, Facebook. Hamare ishq ko log bachpane mein ki hui galti maante hain. Bachpan mein hasrate parwan chadti thi, ab to hasrate bas barbaad hoti hai. School to padhai ka akhara tha, jisme bachpana jitta tha to kabhi pachara jata tha. Dhobi ghat se kam na tha school, jisme master ji kabhi pyar se to kabhi gusse mein hume dho dete the. TV aur bachche bigar jaye to dosh inhi dono per lagta hai. Pesse aur pyar mein kami nahi hai abhi, naa jane kyun phir bhi bachpan yaad karte hain. Bachpane ka sammohan to dekho, jane ke baad bhi aakarshan aaj bhi baaki hai. Log kehte hain bachche bhagwan ka roop hote hain, log unhi bachchon ko kyun marte hain. Bachpan aur jawani dono hi kitni alag hai, ek pyar karna sikhati hai aur dusri nafrat failati hai. Bachchon ko bachpana enjoy karne do, padh likhne ke baad hum jese hi banenge. Aaj jab hum apne aapko dekhte hain, sochte hain bachpan ki masumiyat hum kahan kho dete hain. Kash mujhe koi shakti hoti, meri jindagi bas bachpane mein hoti. Can read: Most popular Maa status for Whatsapp, Facebook. In case you are looking for Bachpan status in Hindi then enjoy our best creation. It is short, cute, funny and lovely Bachpan quotes that you can share with anyone across the border. Live your childhood through sharing your childhood moments. Enjoy and let’s other enjoy. Can read: Cute baby status for Whatsapp, Facebook. Can read: Best Dekh Pagli status for Whatsapp in Hindi, English. We have just covered best, popular, funny and innocent Bachpan status for Whatsapp, Facebook. If you enjoyed reading our Hindi Bachpan quotes then share it with friends on social sites like Whatsapp, Facebook, Twitter or Reddit. In case, you want to contribute for us then simply like us on facebook or tweet for us. It will motivate our team to add values to the Hindi Status for Whatsapp like Bachpan status in Hindi.